The simple, rectangular design of this piece, decorated with espresso finish and dark antique brass knobs, makes it a beautifully quiet addition to your casual or contemporary living room. It is the perfect place to set up your television, and a myriad of compartments create ample storage space for your media and devices. The Sonoma 70" Console by Progressive Furniture at AHFA in the area. Product availability may vary. Contact us for the most current availability on this product. 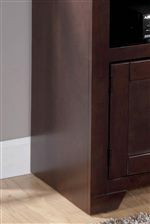 Storage Features three open compartments, below are two doors with an adjustable shelf, to the sides are open compartments with an adjustable shelf, grommet for wire management. The Sonoma collection is a great option if you are looking for Casual furniture in the area.